Posted on 26/09/2015 23/04/2018 by DOAJ (Directory of Open Access Journals)	This entry was posted in Crowdsourcing, News update, Open Access Week and tagged Associate Editor, certificate, community, crowdsourcing, loyalty scheme, Mozilla badges, open access week, volunteer, volunteers. Bookmark the permalink. Volunteers are very well recognized and honored. I am a happy volunteer. I am delighted to hear that Sulthan. Thank you for your time that you spend dedicated to DOAJ! Reblogged this on MY DIARY. That is awesome. Tremendously immersed in happiness to be recognized as a volunteer. Look forward to hear another good ideas to appreciate the volunteers. Thanks Ayang. We are delighted to have you on board as a volunteer! The certificates looks very awesome. 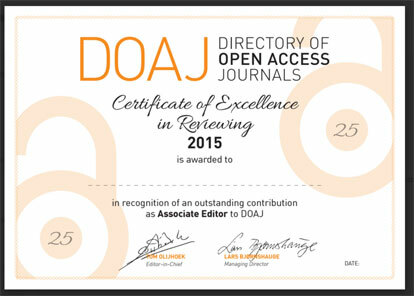 I really enjoyed and appreciate working with you as an Associate Editor.